The REMI Walk-in Stability Chambers are designed for precise simulating, monitoring & control of temperature and humidity conditions required for long term, intermediate & accelerated stability studies at pharmaceutical, chemical, agrochemical manufacturing facilities. 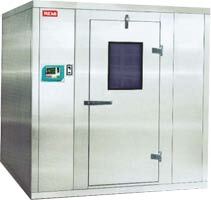 These chambers are manufactured as per GMP norms. They are available in standard or can be tailor made to suit specific requirements.From maintaining of set parameters to documentation, these chambers meet all critical requirements. of sample size and quantity. Constant circulation of air throughout the chamber achieves homogeneous Temperature & Humidity conditions. Humidity maintained by steam injection from Humidifier Tank. Reservoir Tank for storage of additional water. Vaporized humidification & capacitive humidity sensors provide early recovery after door opening due to better response time. Eco friendly CFC free refrigeration system provides reliable conditions as per GMP/GLP norms. Condenser located outside helps to emit hot air beyond working area. Powerful Hermetically sealed Emerson compressor coupled with evaporator & condenser delivers the performance. CFC refrigerant reduce carbon footprint. Audio-Visual alarm for temperature & humidity variations along with utility failures. Low water level alarm & power cut off of boiler heater. Every alarm on machine can be extended by wired connection to security gate. Biometrics Door Access system for authorized entry along with door log . Safety switch in chamber for emergency bell located outside. Accidentally if a person is locked inside then also the door can be opened. Float switch cuts off supply to heater in case of low water level in humidifier tank. Shut off of Humidity & Air heaters in case of temperature over shoots or under shoots. Compressor 'ON' delay timer to safe guard the compressor. Overload cut off relay for compressor. Intelligent controller with easy one glance display of all utilities & Multi sensor values. Felicitates auto switch over to secondary sensor, Refrigeration & Humidity systems. Excellent graphics & convenient operation by color HMI (Human Machine Interface). Programmable controller provides versatility of prescheduled changeovers. Password protection for multiple functions. Alarms & all electronic data recordings as per 21 CFR guidelines. Easy preloading possible of User Manual & basic trouble shooting instructions. Excellent visuals on color HMI. As per 21 CFR Part 11 requirements. Alarm Log along with acknowledgement. Single software for multiple machines. Remi “DATASOFT” software customized to maintain optimum electronic records with all the alarms & events. Software manual & validation protocol. Data export in PDF forma. Remote trouble shooting Support via team viewer. Documentation as per FDA and GMP/ GLP regulations. IQ, OQ, PQ, DQ documents. Data Logger with multiple sensors. Software as per 21 CFR Part 11. GSM mobile SMS alerts for variations. Tailor made sizes as per available space. 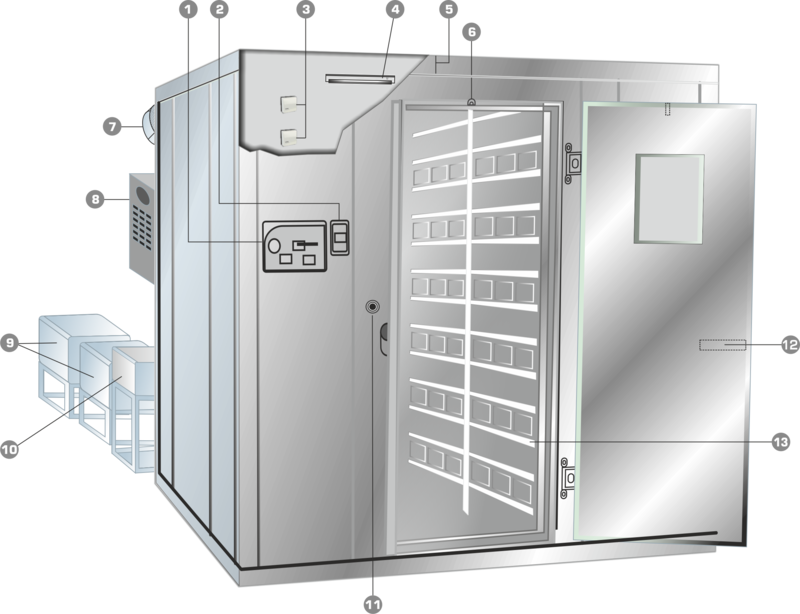 Microprocessor controlled refrigeration system & heaters provide temperature accuracy and reproducible results. Temperature range 20 °C to 60 °C, Accuracy ± 1⁰C. Humidity range 40 % to 95 % RH,Accuracy ± 2% RH. Integrated Data logger for large data storage. Variety of options for the graphic display of process parameters & utilities. Real time clock for proper data management. Electronically controlled humidification system with capacitance type humidity sensors. Suitable for stability studies according to ICH guidelines. Sealed Toughened glass view window on door felicitates sample viewing. Temperature, Humidity and utility failures visual and audible alarms. Remi "DATASOFT" data monitoring software as per FDA guideline of 21 CFR Part 11. Stainless steel racks and trays. IQ OQ PQ DQ documentation. Walbhat Road, Goregaon (East) Mumbai - 400 063, INDIA. Copyright 2014. Designed by Hermitage Softnet. All rights reserved.